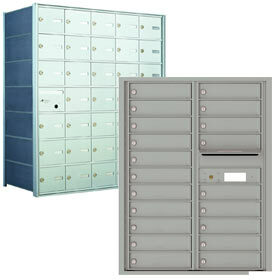 MailboxWorks’ catalog of mailboxes includes an impressive selection of USPS approved high security commercial mailboxes. 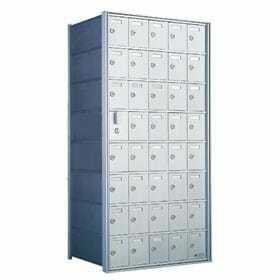 These cluster mailboxes are designed for use in office buildings, commercial building, and industrial properties. They can also be found in universities, colleges, condos, multi-tenant apartments, and in urban subdivisions with centralized mail delivery systems. Auth Florence commercial mailboxes meet or exceed US Postal Service standards. They can also be used for either USPS delivery or Private mail delivery. In October of 2006 the Standard−4C Regulation went into effect. The regulation stipulates that any post mounted or wall mount commercial mailboxes that are installed as part of a major renovation or new construction, must meet the Standard 4C requirements for security and accessibility. These include both indoor and outdoor cluster mailbox installations. This regulation applies to any 4C or CBU centralized mail delivery system. USPS approved front loading 4C mailboxes are a convenient and secure method for mail delivery. 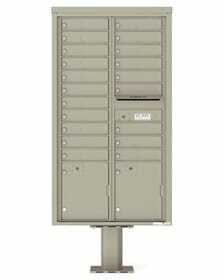 These commercial mailbox units can be wall mounted, recessed into a wall, or mounted on an outdoor pedestal or shelter. Consider Standard-4C compliant front loading commercial mailboxes during your renovation project or as the most secure option for private mail delivery. 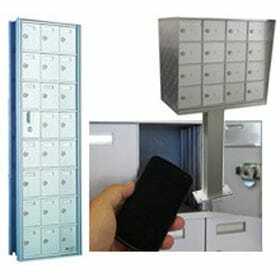 Commercial mailboxes with rear loading capabilities offer additional security for mail delivery. This is especially true for private mail distribution since access to all mailbox compartments at once is only available from a separate secure room. 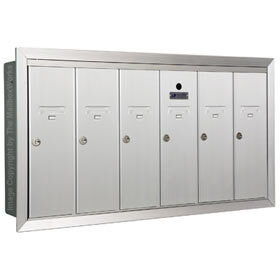 Florence rear loading mailboxes also feature heavy gauge aluminum and steel construction, and secure tenant mailbox locks to further deter mail theft and identify theft. **Note: USPS specifies that 4C rear loading mailboxes be installed in a secure room that restricts public access. Designed to prevent mail theft and fraud, USPS approved horizontal mailboxes include 4C horizontal mailboxes for postal distribution and private mail distribution. MailboxWorks offers the best prices online for these 4C commercial mailboxes as well as commercial mailbox accessories including mailbox shelters and key keepers. Auth Florence manufactures free standing, pedestal, commercial cluster box units (CBU mailboxes) for outdoor mail delivery services. As well, The MailboxWorks carries both recessed and surface mounted 4C horizontal mailboxes for indoor apartment mail delivery services. These commercial mailbox solutions can also be used at any University or College, or wherever centralized mail delivery requires a secure mailbox unit. Florence apartment vertical mailboxes are also available as replacement mailboxes in multi-tenant buildings and apartment complexes. Note: Secure commercial apartment mailboxes have also been utilized in military and government complexes. 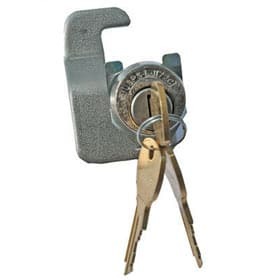 When it comes to being the best in commercial mailboxes, Auth Florence Manufacturing has been around for more than a century. Florence Manufacturing is North America’s number one manufacturer of mailboxes for centralized mail delivery systems. Florence also manufactures mini storage lockers and cell phone storage lockers. The MailboxWorks is a proud distributor of Auth Florence commercial CBU mailboxes, 4C mailboxes, and Horizontal and University mailboxes. We also carry any mailbox accessories you may need including drop collection boxes. Contact The MailboxWorks today if you are looking to buy commercial mailboxes for centralized mail delivery and be sure to ask about bulk quantity discounts. Email to inquire about any of our commercial mailboxes for sale. Contact us to ask a question or for commercial mailbox layout and design assistance. Request a free commercial mailbox quote. How are CBU cluster mailboxes mounted? CBU cluster mailboxes can only be mounted on a pedestal and cannot be attached to a wall. Can you put outgoing mail in a cluster mailbox? Yes, cluster mailboxes can be ordered with an outgoing mail slot. Do cluster mailboxes come with a parcel locker? Yes, by regulation, all cluster mailboxes with 10 or more mailbox units must also include a minimum of one parcel locker. How secure are CBU mailboxes? USPS approved CBU mailboxes are robotically welded, high security, tamper proof commercial mailboxes made from industrial grade aluminum. 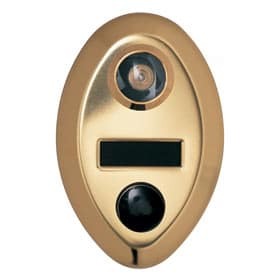 They are also weatherproof and come with tamper proof heavy-duty cam locks so they are very secure. Do cluster mailboxes come with installation instructions? Yes, cluster mailbox installation instructions are available through the MailboxWorks. If you still have questions about cluster mailbox installation, please email customer care. Do you carry cluster mailbox replacement parts? Yes, you can order cluster mailbox replacement parts on our Mailbox Replacement Parts page. Do I need to buy my own anchor bolts? Yes, since installations may vary, anchor bolts are not supplied as per USPS regulations. Can the parcel locker be used as a tenant mailbox? No. USPS does not allow parcel lockers to be used for any other purpose. The removal, conversion, or modification of CBU parcel lockers is strictly prohibited. Can I change the configuration on my F-series cluster mailboxes? No, USPS does not allow any modifications so you cannot change the commercial CBU mailbox configuration in any way. Do you carry CBU mailboxes for private mail delivery? Yes. The CBU commercial mailboxes we carry can be used for private mail delivery service and would require that you buy your own parcel locker and master door conversion locks. Do you sell used CBU cluster mailboxes? No. We only sell new CBU mailboxes. How many types of 4C mailboxes do you carry? 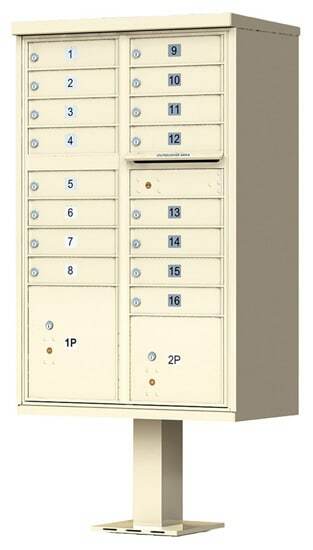 Pedestal Mount 4C Mailboxes – designed for use outdoors where mailboxes are installed on a pedestal stand. 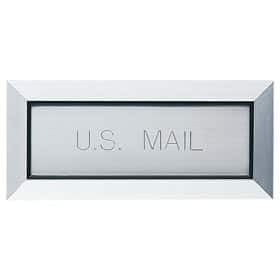 Front Loading Surface Mount 4C Mailboxes – designed for indoor use and installed onto the wall surface. 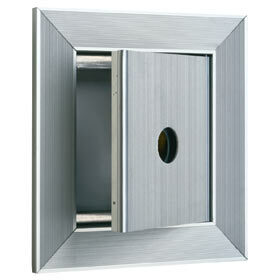 Rear Loading Recessed 4C Mailboxes – designed for indoor use and installed into an opening within a wall with rear access from a private locked room. Do 4C mailboxes need USPS approval? Yes. All centralized mail delivery mailboxes serviced by the USPS must be USPS approved prior to installation. Are there height restrictions for pedestal 4C mailbox installation? Yes. Only the USPS can specify the exact height requirements. 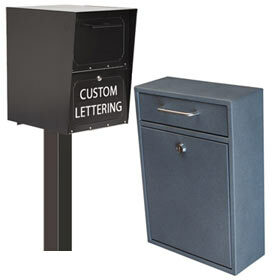 Do you provide installation Instructions for 4C pedestal mailboxes? Yes, the MailboxWorks does provide 4C Pedestal Installation Instructions. What if I don’t need an outgoing mail slot? USPS prohibits the removal or modification of outgoing mail slots. Can I buy additional tenant keys? Yes, you can order additional tenant door keys from The MailboxWorks here. What if I don’t need a parcel locker? USPS requires that all commercial 4C pedestal mailboxes have a parcel locker if there are 10 mailboxes or more and the parcel lockers cannot be altered in any way. Does the MailboxWorks carry 4C mailbox replacement parts? Yes, the MailboxWorks also carries 4C mailbox replacement doors, hinges, and rods/pins. Call us at (866) 717-4943 to order. Can I customize my tenant mailbox doors? Yes, the USPS does allow you to add custom door decals or engraved characters (up to 12 characters per line – 2 line maximum).